As 2009/10 was United's Centenary season, the club elected to launch a commemorative strip for the season, which was to be made by Pro Club, a division of Just Sport. The top was principally black with a symmetrical white flash across the chest, complimented by the colours of both United and Dundee Hibs (tangerine and green) at the bottom of the flash. On the end of the arms or sleeves, were two coloured bands, one green and one tangerine. The shirt carried the same Centenary badge as was on the Home and Away kits that season, which had the added green and gold outlining, as well as the years 1909 and 2009 on either side. Most strikingly were the names of 100 individuals or businesses who had paid to have their name represented on the special edition kit. 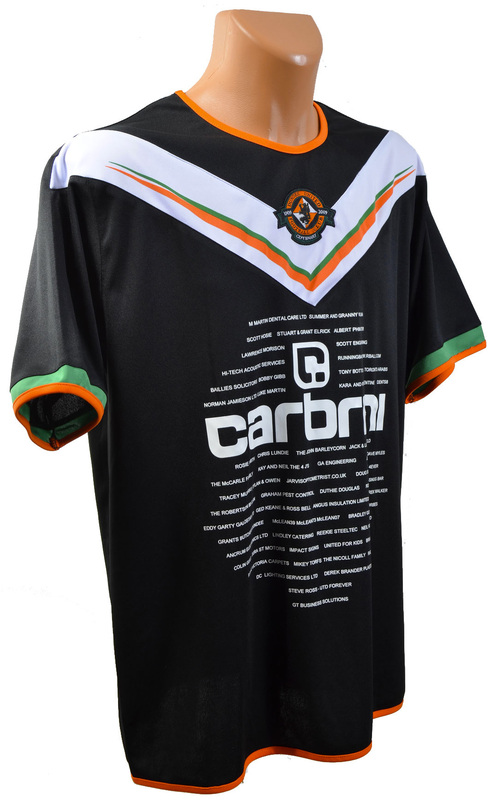 The kit sponsorship carried over from the home and away kits, specifically the youth brand of JD Sports, "Carbrini Sportswear". In addition, the logo of Dundee based cosmetic car repair specialists DENTS8 featured on the black shorts and tangerine socks of the kit. The kit was worn only one time in a friendly match against neighbours Dundee. The game was organised to mark the opening of the Club's new floodlight system and to raise a split gate for each club's youth academy.